Jeff Wilson, founder and chief executive officer of Adaptability Canada, a national supplier of accessible equipment, construction and consulting services, is on site now, leading an in-depth and photo-intensive study of the buildings’ barriers, looking at safety, compliance to codes and standards, and lack of services that may cause future liability or human rights issues. 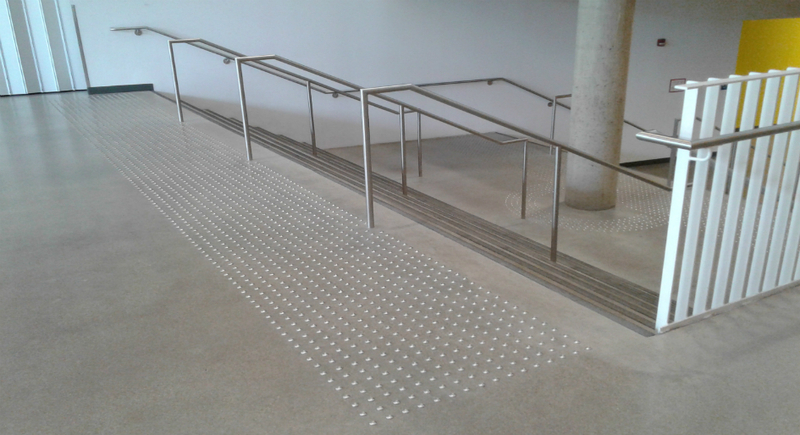 The project aligns with the fourth accessibility standard of the Accessibility for Manitobans Act (AMA), which is to be implemented by 2023 and targets the built environment beyond the Manitoba Building Code. The University of Manitoba, like other post-secondary institutions, is trying to “stay ahead of the curve” and go beyond what the AMA specifies to make the campus more inclusive. Signage is one big barrier often encountered on campuses. There is often a lack of standard design among building portfolios; departments sometimes make their own signs, or signs are made by different firms at different times. The result is what Wilson calls an unreliable “sign stew.” From life safety and directional to identification and wayfinding signs, placement is also central for an inclusive campus. Common exterior barriers also include the maintenance and connectedness of physical paths. Crosswalks, another common barrier, should use proper colours (yellow not white, because yellow is the last colour people see before they go completely blind) and flashing lights. People often take diverse amounts of time to cross a road for reasons like mobility issues or anxiety; incorporating speed bumps at crosswalks stops helps manage this process. Interior spaces like washrooms are often not truly inclusive because they are designed to code, which is a minimum standard. Two years ago, Adaptability Canada conducted a six-month research study on building codes across the country, as well as standards like CSA B651-12. Future-proofing also means approaching about 15 historical buildings at the University of Manitoba as though they are already designated heritage spaces. The team is considering how to preserve historical characteristics, while making the buildings as accessible as possible. Older buildings harbour barriers like bad lighting, basic access for mobility devices and multiple floors with inaccessible essential services, such as cafeterias and washrooms. Proper lighting, a cornerstone in accessibility, as well as health and wellbeing, is often assumed to be part of an energy audit, but is an important factor for people with low vision or cognitive and mental disabilities. “Every university campus is comprised of a mix of buildings including historic buildings and modern builds,” Wilson says. “In the end, many times, the modern buildings have as many issues with accessibility as the historic ones. Before the fall semester, the auditing team will capture physical evidence through measurements and photos. A senior team will then analyze it to against code and internal standards and refine missing information. From this comes a lengthy detailed report prioritizing properties according to the highest levels of risk in safety, compliance and services, along with universal design recommendations, both short and long term. A construction project report summarizes planned renovation projects to ensure they keep accessibility at the forefront. There will be a maintenance audit this winter, since weather conditions can dramatically alter accessibility—paths and parking gets blocked, access is narrowed, and water and dirt gather near entrances and exits. “You can have the best designed building in the world, but if maintenance is poor, there are a lot of temporary obstacles and obstructions. There can be garbage cans obstructing fire pull stations, or salt and sand, leftover from winter, on ramps and stairs, which become a slip-fall hazard. Included in maintenance will be nighttime auditing, looking at how the grounds change inside and outside, after the sun goes down. “A path that is beautiful and clear during the day may not be so at night, depending on how lighting or other things are oriented along the path,” Wilson notes. A concluding report will offer recommendations on how to revise maintenance practices and processes. “The maintenance staff has been really great in stewarding us around; you can tell there is a lot of pride among the staff and for buildings they are taking care of,” Wilson says, adding that the university, too, is committed to delivering high levels of accessibility to students and staff. “Universities and colleges are small cities and towns and often have the ability to be more nimble in decision-making than traditional municipalities,” he adds. A number of stakeholders at the University of Manitoba have a vested interest in what the reports will deliver, with the audit being not just an accessibility project, but an engineering and architectural planning initiative.